Shingles (aka herpes zoster) is caused by the same virus that causes chickenpox. Although the telltale signs of chickenpox are not seen in most people, the virus can remain dormant in some nerves. After many years, this virus becomes active and shows up as shingles. The exact cause for the virus to re-surface is not yet known but age and lowered immunity seem to be influencing factors. Shingles symptoms typically include skin rash accompanied with severe pain. The rash can appear on any part of the body but is usually seen on the torso or face. The rash turns into blisters which dry and fall off in a few days. Contact your doctor immediately if you see any signs or symptoms. Pain medicines and other treatments may be advised by your doctor. 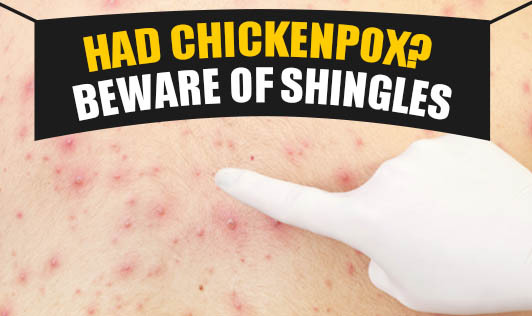 If you have never had chickenpox or shingles, avoid proximity with an infected person.